Roulette is not only one of the most popular table games in land-based casinos, but its online version now attracts large number of players at gambling venues across the web. Even if online roulette is seen as a game of chance, there are ways to increase your chances of winning, so we have put together the best online roulette strategy tips solely for your convenience. There are no certain ways to make profit from online roulette, but following a simple set of guidelines should make a very positive effect on your total bankroll. Unlike the players in real, land-based casinos, online players have the courtesy of choosing from European and American version of roulette, so you should always choose to play the European version, the one with a single zero wheel, as this one has a very small house edge, i.e. 2.63%. You should also look for casinos with either ‘Surrender’ or ‘No prison’ rule, which will give you half of the stake and full stake back respectively if the ball lands on the zero. One of the best online roulette strategy tips we can give you is to only open accounts at reputable casino rooms and the one that regularly publish their payout percentages. There is no point in doing everything right and winning at the tables if the casino officials start wining you up when you request your payout. Be sure to check player feedback on certain casino before placing real money bets. While the house obviously has the edge at the tables, your chances can be significantly improved by collecting various welcome bonuses online casinos offer these days. Provided the bonus requirements are not impossible to meet, you should start playing through the bonus by betting on outside positions as this will give you the best chance of turning the bonus cash into real money. One of the biggest mistakes the players make when looking for the strategies for online roulette is that they believe that previous outcomes are related to the future outcome. This couldn’t be further from the truth as the chances of the ball landing on numbers 5 and 18 will be the same even if the ball has landed on 5 three times in a row. There is a reason why the system by which the roulette outcomes are determined is called Random Number Generator. Since the column with the numbers 3-36 has eight red numbers and only four black ones, one of the best strategies for online roulette is to place one chip on ‘Red’, two chips on column 1-34 and two chips on column 2-35. This way you cover 24 out of 36 numbers, while the one chip on ‘Red’ covers eight numbers from the third column. You, therefore, have two out of three chances of winning on the columns, and since you will minimize your losses when the ball lands on a red number in the third column you are likely to be winning in the long run. Another great online roulette strategy is to bet on a few numbers on the low number side (1-18) and place the same amount on ‘High’. If the ball lands among the high numbers you will win, while you can also win if it lands on one of the numbers you bet on. This strategy gives a great value to your bets. Online roulette can be seen as a continuous game as you are likely to keep playing immediately after you win or lose, so you really need to take good care of your money. Once you double your initial deposit at the gambling venue, you should withdraw at least half of the money, that is your initial deposit, and start a new gambling campaign. This has proven to be the best way to keep your bankroll increasing rather than decreasing. 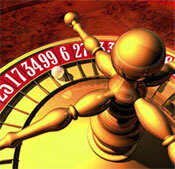 Looking for a reliable roulette casino? Visit our section to find some of the best casinos for online roulette. On this page, you can also find reputable live dealer roulette casinos that we have ranked and reviewed.